Learn more about this astoundingly current production of Romeo and Juliet with this ASL synopsis. Hear from Director Peter DuBois and members of the cast on how this production breathes new light into Shakespeare's classic. Feel the power of the world's greatest writer in a whole new way with the cast of Romeo and Juliet. 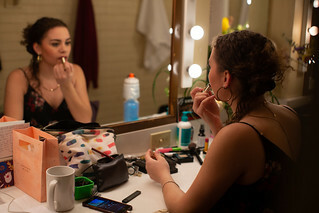 Go behind the scenes with the cast of this astoundingly current production of Romeo and Juliet. See what audiences are saying about Romeo and Juliet. See what critics are saying about Romeo and Juliet. Join us in the rehearsal hall for the first day of Romeo and Juliet. Get a sneak peek of the cast of Romeo and Juliet. Step into the rehearsal hall with the cast and crew of Romeo and Juliet. 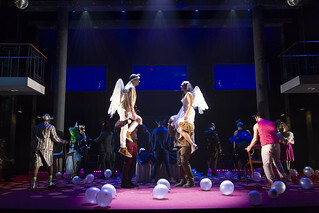 Get a sneak peek of this gorgeously realized production of Romeo and Juliet. 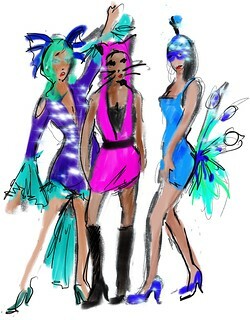 Get a sneak peek of the beautiful costume sketches for Romeo and Juliet. Go backstage at this gorgeously realized production of Romeo and Juliet. Award-winning costume designer Ilona Somogyi’s work spans the globe from New York to Oslo to Chicago and now back to Boston. As rehearsals began on this production of Romeo and Juliet, she sat down with Literary Associate J. Sebastián Alberdi to talk about the work that went into modernizing classic character costumes and designing emotionally and theatrically rich story moments informed by the outfits. “Romeo and Juliet” may be the most famous love story in Western literature, centered on two doomed young lovers in the throes of a transcendent passion as boundless and deep as the sea. But what makes Shakespeare’s play so heartbreaking is the backdrop on which the story unfolds — the bitter enmity between their feuding families, the Montagues and Capulets, that drives the star-crossed couple toward a tragic fate. 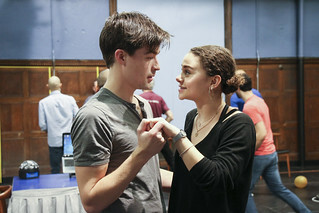 Shakespeare’s classic love story, “Romeo and Juliet,” gets a modern makeover on the Huntington Theatre Company stage March 1 through 31. Featuring the original text and a diverse cast, this production examines important and relevant questions to the present day without pushing an overtly political agenda. Matthew Bretschneider has appeared in Romeo and Juliet (2019), Tartuffe (2017) and Dead End (2000) at the Huntington. Margaret Clark appeared in Romeo and Juliet (2019) at the Huntington. George Hampe appeared in Romeo and Juliet (2019) at the Huntington. Matthew J. Harris appeared in Romeo and Juliet (2019), Tartuffe (2017), Topdog/Underdog (2017) (Elliot Norton Award for Best Actor) and Milk Like Sugar (2016) at the Huntington. Celeste Oliva appeared in Romeo and Juliet (2019) at the Huntington. Zaven Ovian appeared in Romeo and Juliet (2019) at the Huntington. Maurice Emmanuel Parent appeared in Romeo and Juliet (2019), Skeleton Crew (2018), Merrily We Roll Along (2017), and in A Raisin in the Sun (2013) at the Huntington. Omar Robinson appeared in Romeo and Juliet (2019) and Tartuffe (2017) at the Huntington. Lily Santiago appeared in Romeo and Juliet (2019) at the Huntington. Khyati Sehgal appeared in Romeo and Juliet (2019) at the Huntington. Kai Tshikosi appeared in Romeo and Juliet (2019) at the Huntington. John Zdrojeski appeared in Romeo and Juliet (2019) at the Huntington. 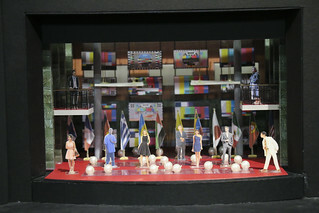 Wilson Chin previously designed sets for Romeo and Juliet (2019), Skeleton Crew (2018) and Tiger Style! (2016) at the Huntington. Russell H. Champa previously designed Romeo and Juliet (2019), A Guide for the Homesick (2017), Now or Later (2012), and Captors (2011) at the Huntington. Obadiah Eaves previously designed Romeo and Juliet (2019) and Shining City (2008) at the Huntington. 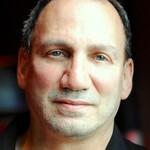 Sordelet INC oversaw fight direction for Romeo and Juliet (2019), Man in the Ring (2018), Disgraced (2016), Mauritius (2006), and Dead End (2000) at the Huntington.